Instagram is the social network that allows you to upload a photo of just about anything and have it look like a mini masterpiece. The application works by taking a photo of a random object, then by using filters and borders, your photo becomes even more amazing. Instagram is different from many other social networking websites where you’ll feel the need to make sure each status update is worthwhile to actually update. Unless you are an obsessive user, you usually wouldn’t update when you are using the bathroom, and when you wash your hands, and when you sneeze. Instagram is a great quality application that shows the creativity within. When you want to get started with Instagram, you’ll have to create an Instagram account. Sign up is relatively easy to do. All you have to do is provide an email and user name. You also have the option of uploading your first image during sign up. Then, social networking services are connected once you sign into them to search for other users. If you provided your phone number during sign up, Instagram will also look through your contact list for users on Instagram. Uploading a photo for Instagram is pretty fun to do. First, you must snap the photo that you want to use. If you don’t want to take a photo or have a good photo already on your iPhone, you have the ability to use photos in your iPhone library. Once selected, you can swipe the bottom area to go through each filter. The top left corner allows you to select for a border or not. In addition, the arrow at the top left allows you to rotate the image. If you want to add the bokeh effect, click the paint drop at the top right area. Want a different image? Just click the “X” to exit out. Once you are finished, click the green check. The eye symbol at the bottom right allows you to hide the filter scroll. Once you are finished, you’ll be asked to caption the photo. Then, select the service you want to share the photo with. After choosing whether to geo-tag the image or not, you then can upload. 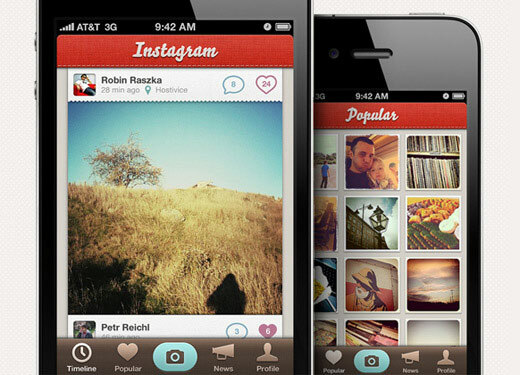 Instagram is one of my favorite iPhone applications on the market today. The ability to make any random object the center of your photography makes Instagram the best time passer. I use Instagram so much that is pretty much turned my Tumblr/website into a photo website. However, I feel that the UI change in the latest update made the experience a little difficult from last time. Additionally, I would love the ability to trade borders with different filters. While you’re at it Instagram, why not all more filters. Despite the few cons, I find Instagram to still be an application I always returns to. It’s the application that you can either love or hate. In addition, if you find Instagram to not be the application for you, there are a ton of other photo applications out there that are better, but they come at a cost.